Bye -Bye wrist and elbow pain! Learning to take care of yourself as you age is very important. The aging process doesn’t have to be painful and discouraging. Prevention is the key and its not really that difficult. There are many strategies to maintain a young and graceful body and mind as you age, but today I will be using my background as a massage therapist to share some common posture compensations and some exercise and stretches to help alleviate wrist, elbow and arm pain. These exercises will only take 5 minutes,but will add many years of quality to your life. Enjoy and remember it takes 30 days of doing to make it a habit. The combination of these exercises will stretch the tight flexor muscles of the forearm and strengthen the weaker extensor muscles. Feel free to leave a comment. Extend arm with palm facing down. Use other hand and gently stretch back all the fingers. You should feel a pull into the forearm. Do this several times and then stretch the webs of the fingers by seperating each finger also pull each finger back to stretch the hand flexors. 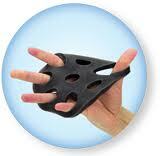 This will loosen the bones and joints of the wrist and hands and also stretch the forearm. Good for arthritis and carpal tunnel. Bend elbow to 90 degrees, palm up. 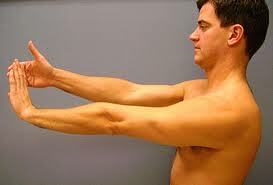 Place other hand on back of this hand with index finger between thumb and index finger of the hand to be stretched. Gently turn palm down (pronate) for 5 to 10 seconds against slight resistance. Then actively turn palm up (supinate)for 2 seconds gently assisting stretch. Using a thera-band or similar stretchy material. Wrap band around hand and use other hand to anchor the ends. Extend fingers and the wrist for 2 seconds then relax. Repeat 8 – 10 times. Wrap thera-band around palm of hand up to the thumb. Take the excess band with the other hand and hold with firm pressure. The starting position will be as if you were going to shake someones hand. Then you will resist against your hand as you turn it up. Hold for 2 seconds, relax, repeat 8 – 10 times. 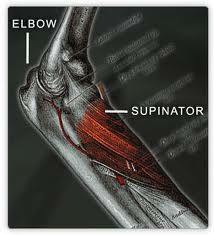 This one is for you Anthony and to all the sufferers of arthritic conditions, wrist, or elbow pain. This is awesome – thanks so much! Good to hear your tendinitis is getting better, maybe you can get back on the tennis court sooner than expected.